Dramont facing the sandy beach, this new apartment opens its door for a holiday in the sun with a lovely panorama. In 77m area, it offers a spacious living room with convertible sofa and armchairs, a dining area with table and chairs for dining, a large fully equipped kitchen (fridge, induction hob, oven, microwave, coffee maker, toaster, dishwasher, washing machine), two bedrooms with wardrobes (one with a bed 160x200, the other with two single beds 902x190) and two bathrooms, and a separate toilet. 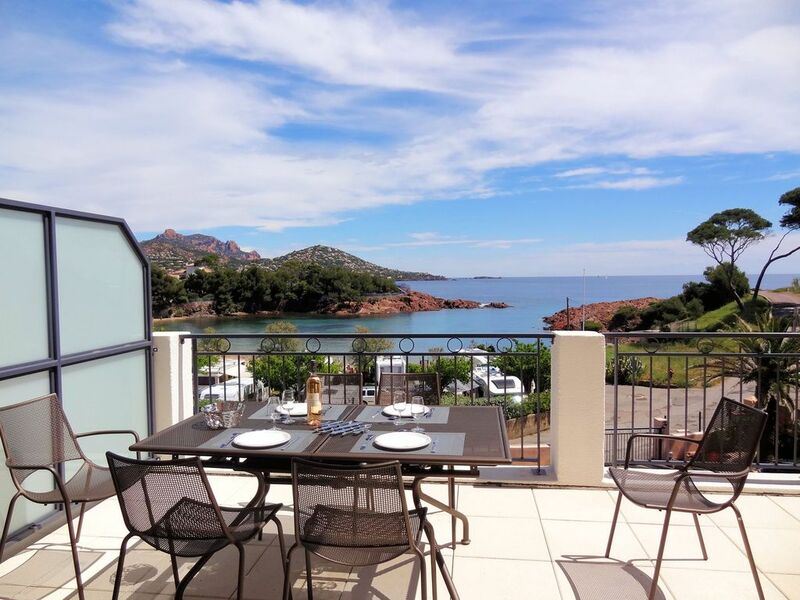 A beautiful 25m² terrace facing the sea and the Esterel Mountains, and features a dining area with table, chairs and barbecue, and a relaxation area with relaxing chairs. Private parking is rented with the apartment. The beautiful beach of Camp Long is right in front 30m. A very nice little restaurant is open on the same beach, so you will find a small grocery store. The other shops are 600m from the residence. The center of St Raphael is 10 minutes drive away, and the area of ​​Agay 5 minutes. Thank you for your nice comment, I hope to welcome you another time, you are most welcome! appartement spacieux très bien équipé et idéalement situé, accueil charmant réservé par Magali. Merci pour votre retour, et ravie de savoir que votre séjour a été à la hauteur de vos attentes! Vous avez été des vacanciers très charmants, et vous serez toujours les bienvenus. Au plaisir de vous recevoir de nouveau dans notre région! The Dramont is a district of the city of St. Raphael beachfront. There are the beautiful Long Bay Camp (also called the Tiki Beach restaurant name therein) which is classified as one of the finest. The area is very quiet, the town center is 10 minutes by car, the area of ​​Agay is 5 minutes and there are all the necessary shops. 30% d'arrhes à la réservation, le solde en espèces à la remise des clefs.